11 Tips & Ideas for Busy Moms: Organize for Success! Let’s face it. Moms are BUSY. So, so busy. Between kids’ homework, sports, music & other activities, taking care of the home, church responsibilities and perhaps working on top of it, there is just so much to juggle and keep track of. And that’s only the basics! Boy, do I get it. In order to keep myself on track, and make the days a little easier and less hectic, I’ve implemented 11 different things into my day that while simple, make a HUGE difference. 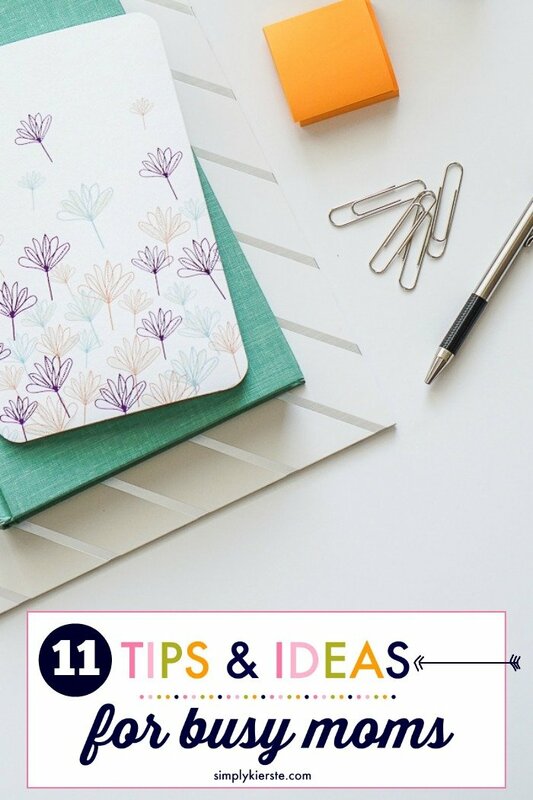 These 11 Tips & Ideas for Busy Moms are my key to organizing for success! I won’t say they’ll make things perfect, because life is life, and things happen. But they give me a leg up, and a fighting chance to do the things I need to do, and the things I want to do! I’ve discovered that keeping my life organized gives me so many more options, and just makes our home run so much more smoothly. Making lists is definitely number one for me. I love lists so much that when I accomplish something that’s not on my list, I add it so I can cross it off! Yes, I might be a little crazy, but they really work. With so many things to do, it’s nearly impossible to remember what they are, plus the details. Writing them down gives me a visual reminder every day and each week, so I don’t forget anything important. It also makes it so much easier to prioritize what I need to do, plus the sense of accomplishment I get when you cross items off your list isn’t bad either! I make lists both weekly and daily lists. If I can’t complete something on my daily list for whatever reason, I either move it to the next day, or to the weekly list. My daily list is prioritized–just with a simple 1, 2, 3, etc.–so I know what I need to tackle first, and what absolutely needs to be done. I include everything that needs to be done for the day–cleaning, laundry, kids’ stuff, blogging, church, etc. I also like to put it in order from morning to evening, but I think it’s really just finding what works best for you. When do I make lists? I do my weekly list on Sundays, looking to the week ahead, and the daily list I do each night before bed. Calendaring is also key to my success! I keep three different calendars, and while that sounds like a lot, they all serve different purposes while working together. Calendar 1: I have a large monthly calendar (affiliate link) that holds our entire family’s schedule for the month. My husband adds any business trips he’s going on, plus the dates of any appointments or activities he has that fall before or after his work day and on the weekend. I add all of the kids’ activities, important school dates, appointments, etc. It’s in a place where everyone can see it, and it’s pretty much the brain of our family! Calendar 2: Right next to the back door is a large weekly calendar that shows just what’s going on for the week. (It’s actually made from an old window with six panes, and I use a Sharpie marker to write on it!) I love it, and because I can fit so much on it, I also add my menu for each day, my workouts, and pretty much everything! Calendar 3: The last calendar is my personal planner, (affiliate link) and my own brain! This is where I keep all my lists, personal calendaring, and anything else I want or need to keep track of. This is my system, and I love it, but the details aren’t as important as finding something that works for YOU and your family is. Experiment until you find what you love…it’s worth it! Establishing a routine at the most important and busiest parts of the day helps me and my kids. For us, mornings before school, right after school, and at bedtime are the key hours where chaos has the most tendency to happen. When we have a regular routine and stick to it as best we can, then everyone knows what needs to happen, and we avoid some of the craziness. Since I’m home during the day, I have my own routine that helps me stay on top of things. Cleaning (my cleaning method), getting dinner started, laundry, to-do items, errands–all of those things I fit in around my work, which I also do from home. Does this mean I’ve never flexible or spontaneous? Of course not! But a general routine is definitely a major player when it comes to organizing my day. I’m not just responsible for my schedule, I’m the coordinator of the whole family’s schedule! Weekly family planning sessions are a really great way to tackle everything that’s coming up for the week, and avoiding as many last minute issues as possible. Going through everyone’s schedule, putting them on the calendar, making coordinating lists (i.e. birthday party presents to buy, special days at school, menu based on how busy days are), and making assignments between my husband and I for transportation–it’s all part of the planning. Sometime’s we’ll realize we need to call in reinforcements–perhaps I need to get a babysitter to cover a certain time frame, or work out a carpool situation. For us, Sunday afternoons or evenings are the perfect time to do it. We’re usually all home, and it’s right before the start of a new week. It can be done anytime that works best for your family! It’s also a good time to talk about other family issues–if there’s something that you want to speak with your children about, something that your family needs to work on (for us…chores, listening right away, etc. ), and especially to tell them that they’re doing a great job! It’s coming together as a family and working together to make it run as smoothly as possible. Kids like having a voice too, and this can give them one. We are big believers in every family member being involved in maintaining our home. We all live here, we all make messes, and we’re all responsible for ourselves plus contribute to the overall care of the house. I am just one person, and I couldn’t and shouldn’t do it alone. Our household runs SO much more smoothly when we’re all pitching in! At our house, kids are responsible for making their beds each morning, keeping their room clean, picking up after themselves, and a few additional chores like dishes, trash, laundry, bathrooms, and more, depending on age. You can find my post on Why My Kids Have Chores, plus an age-appropriate chores guideline HERE. They also get to help with dinner once a week, which they actually love. They run down to the basement and get ingredients I need from our storage, help with the stirring and cooking, plus they’re in charge of setting the table and calling everyone to dinner (which they get super excited about). It’s a huge help to me, and it also gives me some extra one-on-one time with each child. Yes, I usually have other kids up at the counter doing their homework, and someone at the piano or on the violin practicing, but it really does add to the overall running of the home. Plus, they’re learning new skills. It’s a win-win! This one is SO important for me! There’s is such a huge difference in how my day goes when I prepare the night before…and when I don’t. My goal is to eliminate as many things as possible from my morning lineup. It’s totally worth the time it takes to do it, even if I’m tired. I also set my alarm for 15 minutes earlier than I have to be up. It’s time for my head to wrap around the fact that it’s morning, and to just be mentally prepared for the day. Sometimes I do hit the snooze button, because I feel those 15 minutes are best used for sleep, but I do notice a difference when I don’t have to hurriedly jump about of bed and get going. Can I just admit to you right now that making dinner is my BIGGEST nemesis? It’s honestly my least favorite thing to do. I would rather clean 50 bathrooms! Seriously. I don’t know if it’s just that that time of day is so crazy, or what, but it’s always been something I’ve tried to make easier and better. It also needs to be done everyday, so planning my meals ahead of time is one of my biggest timesavers. How often you shop is totally a personal preference, and for me it’s weekly (with bulk shopping once a month). I make a weekly menu, then shop for those items also once a week. Planning ahead for meals on the go is also a huge help and timesaver. With sports and music and dance and all the other stuff that’s packed into our nights, sometimes meals have to happen on the road. 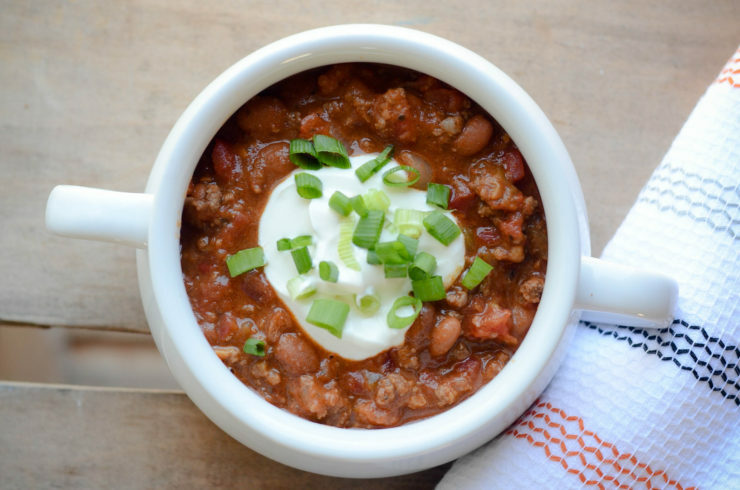 Making or planning for meals I can grab quickly on my way out the door is a great way to help make those crazy afternoons and evenings less chaotic and crazy. Waking up to a straightened house makes my day go SO much better. When I don’t have to start out the day doing dishes or cleaning up a mess from the day before, it gives me a fresh start to the day. I just function so much better and am a lot more productive with a clean and orderly home. One of the things that’s really helped AND gets the kids involved is our family quick clean-up each night right before dinner. We use the buddy system (one older, one younger), and divide the main part of the house into sections. For five minutes, we go around the house picking up and straightening, and when we work together, we can get a lot done! I also require my kids to pick up after themselves after school (no backpacks, shoes, belongings strewn about), so that cuts down on what we have to pick up. Doing it before dinner gives the kids an incentive to move quickly! It really doesn’t take long, and my goodness, it’s so helpful! Who else thinks right after school is the craziest part of the day? All of my kids come in the door, so excited to tell me about their day. They also hand me 25 papers about 25 different things happening at school that week, and they’re all talking about them all at the same time. To keep the chaos at bay, to keep on top of all the papers coming through my door each day, and to make sure each child feels they get my attention, I implemented a strategy that has really helped. Every day after school, each child gets five minutes with me, one-on-one. We go through their backpack, they can give me any papers I need to see (I file them right then), sign anything that needs to be signed, and see what homework they have. I also get to hear about their day, and they give me the highlights and lowlights. I’m able to connect with each child, keep up on my calendaring (I can write things down right away), I can stay on top of what’s happening at school, and keep paper clutter at a minimum. It’s the best five minutes ever! You can find a list of all five of the things I do after school to stay connected with my kids HERE. This is my motto in life. I live by it, and it does right by me! It’s so much easier to stay on top of things when things are organized, and you know where they are. It reduces the amount of time you have to search for something you need, and gives you a better sense of what you have. 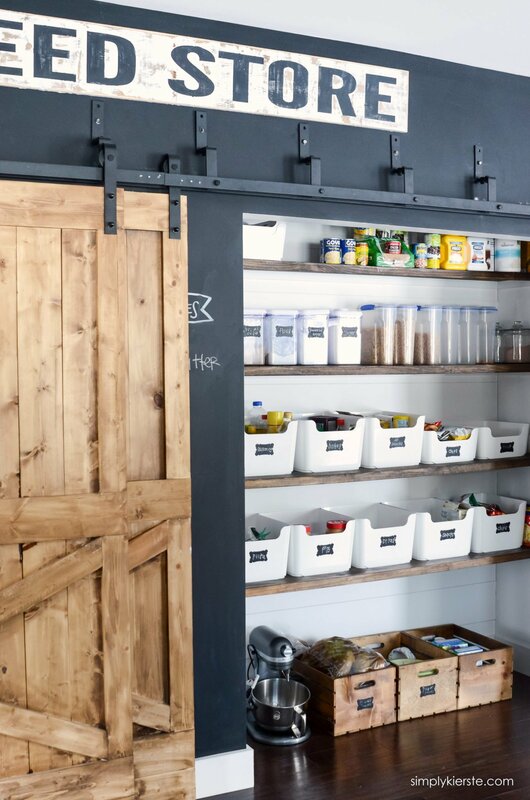 For example–I have a school lunch packing station in my pantry, and I can’t even tell you how much this has helped me! I’ve tried to create things like this throughout my house and in my drawers and closets, and truly make a place for everything. I teach my kids that when you take something out, you put it back as soon as you’re finished with it. That is still a work in progress! This is often the hardest one of all. Moms tend to put everyone else first, and while that might need to be case a lot of the time, it can’t be the case all of the time. You can only give what you have, and if you’re so drained you are barely hanging on, you just can’t do what you need to do well. It’s also much easier to get overwhelmed and burned out when you don’t take any time for yourself. No, it’s not selfish! Even a few minutes during the day can make a difference. Carve out time for what’s important to you, and what will help most. I’m a better mom and person when I exercise, so I schedule in time to go running or get a workout in. It’s a priority, and I make it work. Reading a book, taking a bubble bath, meeting a friend for lunch or dinner, exercise, yoga, getting a pedicure, watching a favorite tv show…whatever it is you love, find the time to do it. Write it on the calendar if you have to, and DO IT. 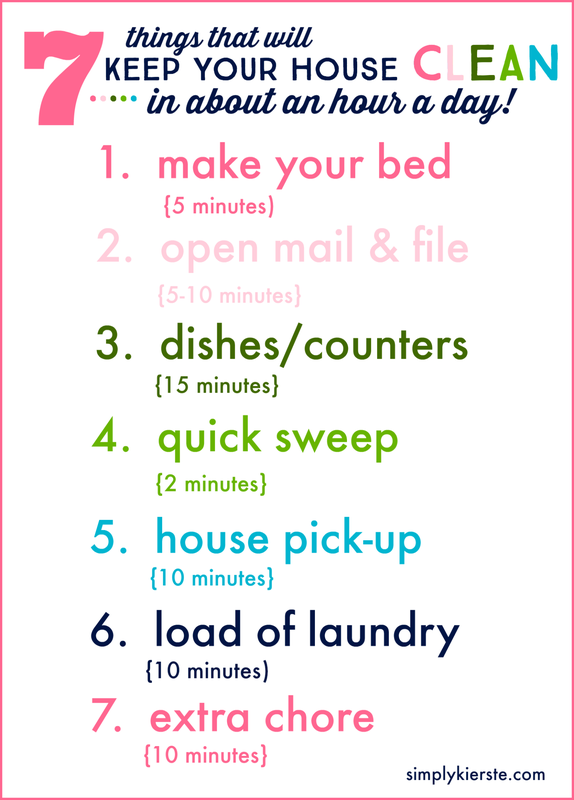 7 things to keep your house clean in about an hour a day! These are fantastic tips, many of which I’m working on implementing in our home. It’s definitely hard finding balance with all the craziness life throws at us, but I’ve found that being organized and structured helps a lot! Thank you for saying it out loud, “I hate making dinner”. Me, too!!! I mean, sometimes it is satisfying on the rare night when they all eat it, but mostly it is just messy and a chore. Thanks for saying it. I love the idea of everything having a place. I know that, of course, but it is a work in progress. My 3 kids just started a glorious Spring Break today so we have a little more time to implement some new strategies so will work on that one. Good tip for life. Nice read and reminder. Thanks for putting that together. Always nice to read your blog so thank you for the time and effort. I don’t know how you fine the time with all of those kids! These are great tips on getting organized. I feel like a complete failure in reading all of this! I try so hard to plan ahead and keep up on the house, but living with 4 people with ADD and ADHD, organization is one of their biggest challenges, and has become mine by default. Any tips on helping them get organized and stay organized, without sounding like a broken record to them would be greatly appreciated! We have tried so many different things, but it is partly just how they are wired. I feel like it’s a life skill that is necessary for success. The struggle is real! Don’t feel like a failure! Seriously! Every family and home is so different, with different circumstances playing a part. I do have a couple of children that while not ADHD or ADD, they really struggle with organization as well. I think the number one thing that has helped to get them organized is to give them specific places for their things. It’s why each of my children have a number–and it goes on everything! They have a shoe basket with their number, and a hook with their number, so when they come in from school there is no question about their space. The hooks in the bathroom have numbers–that’s their hook for their towel, and they know where it’s supposed to go. I also have a hanging basket file for each child with their number on it, so they have a place for any school paperwork they are working on or need to save for later. I have them pick up as they go, because it’s so much more overwhelming at the end of the day or before dinner to pick up a huge mess. So as soon as they come in the door, their snack is ready for them once their shoes, coat, and backpack are hung up. Incremental organization is what I call it! Same thing before dinner, and then before bed. One of my daughters really struggled with keeping her homework organized (5th grade). In their school they have binders for every subject, and a take home folder, and it was just too much. She kept forgetting her homework, or forgetting what she had to do, or forgetting an important item at school. I finally simplified it for her, and created a very basic folder that she could put all of her take-home homework in, plus a list of what it was. That simplification made all the difference, and she could then handle it, and be more successful. Simplification has also made a difference for my kids that have a more difficult time focusing, so I think that’s another reason why the number/specific baskets have worked so well. You have some great tips, thanks for sharing! I love learning from those with bigger households. It would be great sometime to read a “day in the life” type post to see how you put this together on a given day. Actually a given week would be even better! ?